Location, location, location. In the real-estate business, the location of a property is one of the biggest factors influencing how much a property will be rented or sold for regardless of condition and size. This rule holds true in the food truck business as well. If you’re able to find profitable locations to park your truck consistently, even a mediocre food and menu can yield profits. But finding the right place to park isn’t as easy as it sounds. There is much that must be considered before rolling up on a new site: 1.) Learning if there is a permit or fee required. 2.) Finding a large-enough space to park. 3.) Is there enough foot traffic in the area to make the trip worth the time and money invested in getting there? Keeping each of the above factors in mind, below is a list of places that often have enough space to park and enough people to support a food truck. Keep in mind that once you find that winning location make efforts to establish your presence in that area in a consistent basis. This will help win over repeat customers and help you get to know the local players / competitors in that area. Markets popup all across the United States from the Spring – Fall months, which can vary in length depending on where in the country you live. Farmer’s Markets are usually held in a recurring location 1 – 2 times per week and provide an ample supply of foot traffic. Farmer’s Markets work better for some types of menus better than others. If you decide to test a market in your area try to play up the any ingredients or menu items that are sourced locally. Serving products that are purchased locally and responsibly produced can make your truck more attractive to this market. Concerts, children’s festivals, and other special events can yield nice one-time gains for your truck. Best of all, you usually don’t need to invest much energy in promoting yourself at these events since there’s usually a built in audience that’s ready to spend. If you find a festival or event that has yielded a strong payday be sure to stay in touch with the organizer of the event. Often, popular events are held once per year. By staying friendly with the organizer you’ll increase your chances of being invited back next year. 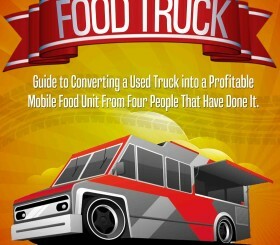 In recent years, the food-truck revolution has exploded with popularity. As a by product of the increased exposure in the industry, more food trucks have popped up and owners have started to work together for the common good. One result of this team work has been multiple trucks parking in a single location on an agreed upon day and time. Typically, a group of food trucks banding together in the same area will attract more attention than a lonely vehicle. One of the benefits of networking with other owners is that you’ll become aware of the location and time of these truck parks. You don’t need to be best friends with everyone, but try to keep a professional relationship with your “competitors” to ensure you get invited to these lucrative events. Business and financial districts may already be competitive locations depending on where you live. But they remain worth investigating for the savvy food-truck entrepreneur. Bustling districts of white-collar workers like this often exist in downtown areas of larger cities. If you can secure a parking spot that isn’t already taken by another concession stand these areas can provide a consistent stream of customers for a mobile restaurant. When folks drink, they get hungry and don’t mind paying for food. If there’s a popular bar in your area you could end up making a lot of money for just a few hours of work if you don’t mind working in the evening. One of the best strategies is to position the truck within eyesight (and smell sight) of the entrance. This way bar patrons will smell the delicious fare when entering and especially exiting the building. It’s a winning formula for a successful location. If you find a bar that is profitable for your food-truck, do everything you can to stay on good terms with the owner of the business as this type of relationship can yield profits for years to come. Believe it or not, gas stations can be a very lucrative place to setup shop. Often workers that are employed in construction, shipping, or law enforcement end up purchasing a 5-hour old hot dog or microwaveable sandwich from a convenience store for lunch while filling up with gas. But if there’s a better alternative, many folks will often fork over a few extra dollars in return for a decent meal. More often than not, gas station owners and managers appreciate having these food trucks around too since trucks can draw more attention to their businesses and keep people in the area longer. As long as you get approval prior from the business before showing up this can be a win-win scenario both for yourself and the gas station. Tip: When identifying good gas stations to prospect consider larger convenience stores or “super” stations that get a lot of customers. One place to begin the search is near major highways and interstates because you can also end up serving hungry travelers as well. As a small business owner, always keep your eyes open for new and profitable locations to park your vehicle. Also, ask other mobile entrepreneurs where they feel the best spots are. If they’re not willing to share their favorite locations just follow their Twitter feed to monitor where successful food trucks like to frequent. The longer you stay in business and remain friendly with other business owners, event organizers, and continue to network you’ll eventually find the most profitable spots in your area.